The Consumer Food Inspection unit has broad responsibilities ranging from inspecting food salvage operations to ice manufacturers. The primary focus of the unit is to protect the consuming public by performing inspection and licensing activities ensuring that foods are packaged, processed, prepared and stored in sanitary and safe environments. 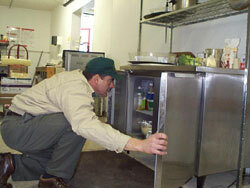 Inspectors protect the consumers, while educating and working with owners of food businesses in the state. This partnership assures consumers of a safe food supply while providing marketing assistance to small and large businesses alike.